Old habits die hard and the new Russia is not, it would appear, so very different from the old. Certainly this was the clear, overriding message of 'My Perestroika',﻿ shown to a packed audience last Saturday as part of the Budapest Film Festival. And if old habits do indeed die hard, then so it is [at the risk of mixing metaphors] that still waters run deep. For Hungary, whilst embracing the new democracy, paradoxically resists change and endeavours, when and where possible, to maintain the status quo. 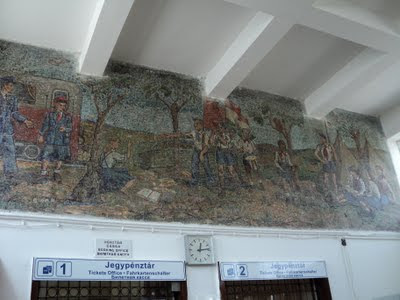 So it is with the Gyermekvasút, the Children's Railway, a unique venture by which a daily train service, operated in its entirety, with the exception of the engine driver, by children between the ages of ten and fourteen, runs through and across the Buda hills. Inaugurated in 1948 by the Communist Party as part of the Pioneers' Movement, the principle of service to the state remains unaltered. 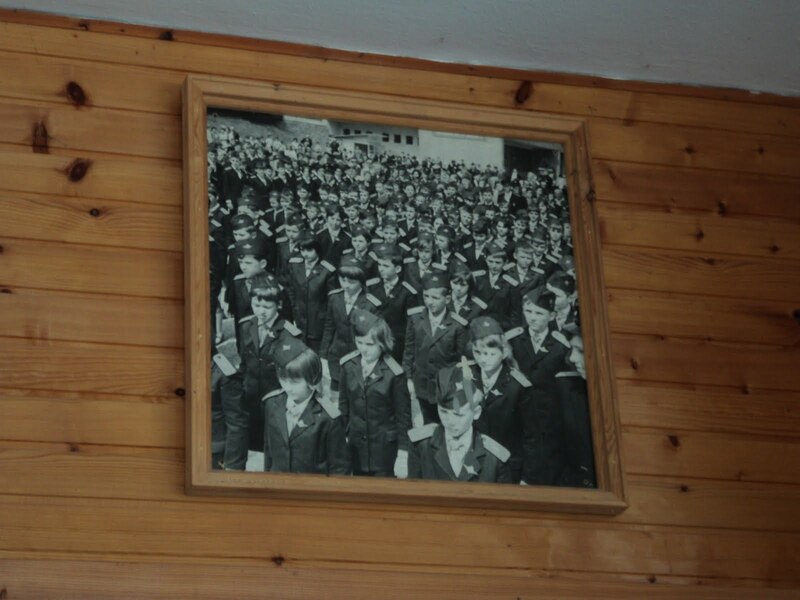 True, the regime change of 1990 brought about some slight differences: Uttorvaros [Pioneers' City] has become Csilleberc, the name of a local district, the red star has been removed from the trains and the buildings, and the uniform red ties replaced with blue. Beyond that, and we are back in those optimistic years of the 1950s and 1960s. Total nostalgia! The train, its red and cream livery of 1961, the polished seats of slatted wood, the precast concrete stations along the way, the uniformed guards, raising their hands in salute, the ticket punch, the signage translated into Russian, all recall a yesterday belonging to today. And the woods through which we slowly travelled. Emerging leaves of freshest green, white cherry blossom and everywhere the sweet violet, Viola odorata, carpeting each bosky clearing along the way. Whilst far below us the Danube glinted and the city, basking in Sunday idleness, stood still in the warmth of an April sun. Today a new week beckons. Friends depart, life continues, and the wheels of change turn with tantalising slowness. My dears, I hope you had a lovely time with your friends. It is fascinating to read that Budapest Film Festival last Saturday was a success. It's quite incredible really after talking so much about how we liked art films, I found out my local art cinema is closing down (as you already heard in my latest post). I found the signs of the old Commnunist regime quite haunting (partly because I once lived under such regime). But it is also nice to realise that things are beginning to improve. There is a light at the end of the tunnel and the children on the rail carriages still do smile...and no doubt, they are the symbol of optimism for the future. 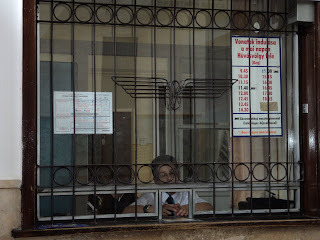 The ticket master at the ticket station reminds me of a little railway station in a small Somerset village. Yes, thank you, we had a most enjoyable time with Simon and Stephen and were sad to see them go. On the subject of cinemas, we were shocked to learn that yours is to close. That is, as a great friend of ours would say, BAD news!! We do understand so well how you will appreciate and know what it means to live, having experienced it, under an undemocratic regime. And whilst life for many in Hungary is currently very hard, there is, nonetheless, a great sense of optimism among the young. This sounds absolutely fascinating! As you say some things have changed with the breakup of the former EAstern Bloc, howver I see this as a positive in this case where things have not changed. In this instance, as you say, we are quite pleased to see an absence of any change. In other cases, of which there are many as you may imagine, to be stuck with the status quo is more than a little frustrating. Thank you for that most interesting post. A children's railway, what an excellent idea! Children would love being part of that and they would learn so much from it. If it were here it would be stopped by health and safety concerns - they have been taken to quite excessive levels! We have an old steam train here in Melbourne that operates in the Dandenong hills and is called Puffing Billy. Although not run by children, it si very popular with the young and the young at heart! We too cannot imagine how the railway continues without being closed down for, as you put it, health and safety reasons. In the UK too these have become major,and in our view, absurd issues. Puffing Billy sounds to be great fun. Thank you for including the website which we shall most certainly look at. See that wasn't hard at all...second post in less than a week! Really very interesting, what a unique concept I wonder who actually originated the idea and how they felt it would help the children promote the ideals of communism. Hoping to get my side bar renovated this week and add you to it....if I can remember how to! What an interesting post! I do understand the sentiment of seeing change and yet feeling some things remain the same. I grew up in Nicaragua, troubled history there, and the memories of conflict are still fresh in our collective minds. Keep up the writing! Ah yes, but we are only just beginning!! We do not, in fact, know whose was the original idea but it was certainly one of many designed to promote allegiance to the state - something which still remains. It is not at all uncommon to hear Hungarians referring to the 'Motherland'. We can well understand, your having grown up in Nicaragua, your appreciation of what it means to live in a troubled country. Always the power of the state is a force to be reckoned with and, very often, resisted. Thank you for such a kind comment and for becoming a Follower. Interesting post. The mural is certainly eye-catching. Is it a mosaic or a fresco? I am enjoying your blog and appreciate that I am also learning all you are going through as a country. The Urania Cinema is stunning, and the Children's Railway, so sweet. My son would have adored that as a child. We were fortunate enough to travel when Kenny first stopped working after his illness. We did two European Cruises, as staying in one room, and being brought from place to place made the most sense. the history of the countries we did see came alive. The architecture so beautiful, and the people so generous and kind. I can only imagine how amazing it would have been if we were not on a schedule. As Americans, too often we lose sight of how young our country is. Thank you for sharing a bit of your part of the world with us. How sad the train has taken away our Hattatts! Thank you! In fact, as you have clearly spotted, it is a mosaic and dates from the establishment of the Pioneers' Movement and the railway. As a piece of Socialist Realism it is quite interesting. We are so pleased that you are enjoying the blog and much appreciate your kind comment. Hungary is, as you remark, in a state of flux - a situation where, it seems to us, we lurch from one crisis to the next. However, we would not swap it for the world. Your holidays sound to have been most interesting and we totally understand the idea of having a base, as opposed to living out of a suitcase. We thought that perhaps we should not be missed. As it is, we shall rejoin the train at the next station! Meanwhile, thank you for your comment. What a marvelous post! The children's train program reminds me vaguely of the same kind of thing that might have been part of one of our WPA (Works Projects Administration)projects that was set up during the New Deal of Franklin D. Roosevelt right before WWII. Amazing that it is still running! Also, I SO love your beautiful, positively lyrical, description of going though the woods. I can just smell those violets! Finally, thanks for your nice comment on my latest image post, "Journey." I can envision her on the train with you! Your comment is most kind. Our name, in fact, comes from the Middle East and can be traced back in England to the early C18. We are now the only ones in Britain with the name! 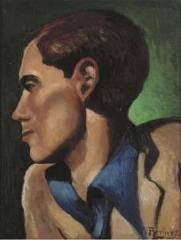 We were most interested in what you say about the WPA in the United States - it sounds a very similar project although we imagine less long lived. The Children's Railway?! How wonderfully strange! Havew read your last three posts, have enjoyed them and have, as I suspected I might, learned a few things. The concept of the Children's Railway is very odd and we certainly, when we first discovered and went on it some years ago, thought it very strange indeed. Our visitors always love it! Thank you so much for your very kind comment. We send greetings from Budapest. When we first arrived ten or so years ago, Hungary, emerging from years behind the Iron Curtain, was a forbidding and strange place. Today it is a country we have come to know and love. Thank you for your kind comment and for becoming a Follower. Thanks to visit my blog everyday !!!. Happy Easter!. It is a pleasure. We wish you a very peaceful and happy Easter. Each visit here opens my eyes to the whole of the wild and weary and wonderful world beyond what is easy for me to find on my Tv or even out my window. Thank you. How really kind of you. And we especially appreciate the alliteration which sums up, so succinctly, the whole country. Thank you! Thank you so much, both of you for your comment on my blog post. It never ceases to amaze me how small this world really is. I found your post so interesting too - the children's railway looks amazing and the journey through all the greenery and cherry blossom must have been so breath taking. I love your blog! I'm so happy you discovered mine so now I can discover yours! Thank you - what an interesting life you live. I look forward to reading and learning more about the world via the Hattats! The journey on the Children's Railway at this time of year is, as you say, lovely with all the promise of what lies ahead. Equally, we also enjoy it in the depths of winter when the hills and woods are deep in snow reminding us of the Robert Frost poem! Thank you so much for your very generous and kind comment. We too are delighted and will look forward to the sharing of ideas and opinions [and just simple happenings] in the future. I've been on plenty of 'small railways', but never one being run by 'small people'. It's a strange idea, but one that must be really enjoyed by the children themselves. How do they join-up? Are they specially selected, or do they just apply? A very good question and one to which we do not know the answer. 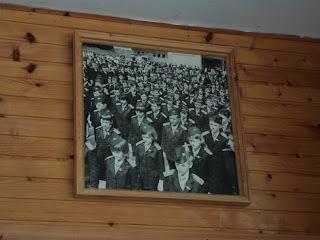 In the past, before the change of regime as the collapse of Communism is known here, the Pioneers were, almost certainly, the children of loyal Party members. We hope that they enjoy what they do. Whatever, they take it very seriously. Welcome on board!! We are delighted to have you as a Follower and, having discovered your own interesting and varied blog, very much look forward to keeping in touch. And thank you for your generous remarks. We too are delighted to have found you and we look forward to our continuing dialogue. Thank you for your kind words. I do the London Antique and Decorative Fair as well but only visit twice a year since it's a trip for me. Thanks for visiting my blog! We are delighted that you like the mosaic and are pleased that it has survived the 'regime changes' of the past. We try to look in at the Antique and Decorative Art Fair at least once each year and love the way that the old and not so old are combined in such stylish ways. I think this so fascinating...especially the fact that the railway continues to have the children running it, they must be very proud to be there. What a wonderful education they're getting just by participating. I can imagine it's quite a joy to be a passenger. Thank you for sharing this very interesting and unknown bit of present-history. We think that in all probability it is unique. Certainly we know of no other like it in Europe. Yes, it is really thrilling to be a passenger which is fairly often as we take most of our visitors for the experience! Thank you so much for your comment and a Happy Easter. how absolutely fascinating....puts a whole new twist on 'the railway children'....I love learning something new, thank you!! You are right! It makes the 'railway children' look complete amateurs although we must say we recall both book and film with a certain fondness. I am fascinated by this post. I will be sharing it with my husband, who lived for a time in Communist Poland during the 1980's, for while I am sure he has never seen a railway run by children, there are other aspects of this story that will take him right back to those days of his youth spent riding the train all over Eastern Europe. I truly love your blog. I'm so happy that we found one another out here in the blogosphere. We were absolutely fascinated that your husband lived in Poland before, as they say here, the regime change. Although things have moved on in Hungary, there is still a long way to go and, alarmingly, most recently things [being government and politics] seem to be slipping backwards. Thank you for your really kind words - they are much appreciated. I think it is a wonderful idea for children to run their own railway service, much more exciting than a Hornby train set! Absolutely! Why play with toys when you can control the real thing? Having said that, we have always hankered for a train set but, most recently, have settled for a dolls' house!! these pics speak to me. I'm a native Bulgarian. Happy Easter! As a native Bulgarian we can readily see that there may well be a resonance in these images for you. Thanks so much for stopping by Town and Country Mom and becoming a follower. So happy to find your blog and look forward to reading more about a part of the world I know so little about. We are so pleased that we have found each other and very much look forward to sharing our different perspectives on life. Dear Jane and Lance, I wouldn't mind a go on that! Perhaps one day we can take the train together!! And, there are some very interesting young fashion designers in Budapest for you to check out. Of course, we will link it back to your blog as a gesture of Thank You. We are thrilled to welcome you as a Folower and are so pleased that you have enjoyed reading our blog. We should, in principle, be delighted to be interviewed by you for Budapestzin. However, we should wish to discuss the idea further with you before finally going ahead. We leave for the UK at the end of this week but shall be in touch on our return in mid May. In the meantime, we shall look at the weblink that you have provided. One of my Dolly Projects is to "collect" trips on trains as I travel. I had never heard of the Gyermekvasút till now, so shall add it to my list for my next trip to Budapest. The smell of violets in the woods is making me even more daydreamy than usual. 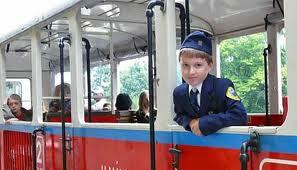 On your next visit to Budapest we hope that you will find time to visit us as well as the Children's Railway. We know that you would love it and the ride around the Buda Hills is spectacular. We like it best in Winter with snow all around and the carriages are heated by ancient stoves!!! How kind of you to invite me to visit. It's a date! I hope it is not too long before I visit wonderful Budapest again. And, we too hope that it will not be long before you are in the 'Motherland' again! !